On 20JUN, WestJet inaugurated its new regional airline service, WestJet Link, from Cranbrook and Prince George to Calgary. Service starts from Lethbridge and Lloydminster to Calgary on 21JUN and Medicine Hat to Calgary on 22JUN. In total, WestJet Link connects five new cities to the airline’s hub at the YYC Calgary International Airport. "This is a great day for the communities who now benefit from WestJet's non-stop service and convenient connectivity to the WestJet network," said Tim Croyle, WestJet interim executive vice president, commercial. "WestJet continues to offer Canadians more travel options and WestJet Link brings more choice, lower fares and WestJet's renowned guest service to these five communities." With these new routes WestJet now operates an average of 147 daily departures to 49 destinations. 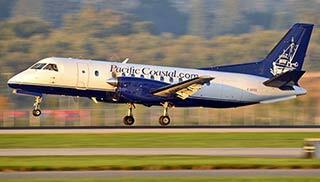 All WestJet Link flights are operated by Pacific Coastal using its fleet of 34-seat Saab 340B aircraft. Each aircraft includes six seats available in WestJet Plus, offering guests advanced boarding, no-charge for two checked bags and seating at the front of the aircraft. "Pacific Coastal Airlines is proud to become part of the WestJet family through the launch of WestJet Link," said Quentin Smith, president, Pacific Coastal Airlines. "This is a great partnership between two Western Canadian airlines that share similar corporate values and a customer-focused approach to doing business. Together, we will work to provide better connectivity and offer more transportation options for the people and the communities we serve."